This year I’ve been lucky enough to participate in a fantastic series of events called Pinners Conference. The first conference in their cycle was just a couple of weeks ago in Dallas, Texas (there are 4 conferences in total). It was so much fun! While I was there I had to opportunity to not only show off the new crepe line and tissue packs, but I also got the chance to teach three crafting classes to a fabulous audience of eager Pinners! 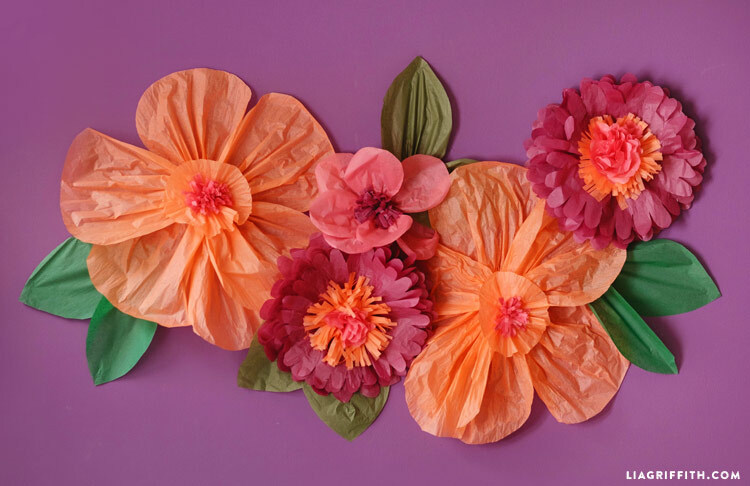 The first class was of course on crepe paper flowers, the second covered crepe paper botanicals, and in the last class I taught how to make these gorgeously happy jumbo tissue paper flowers! For those who couldn’t make it to Pinners Conference TX, here is a tutorial to get in on the fun. 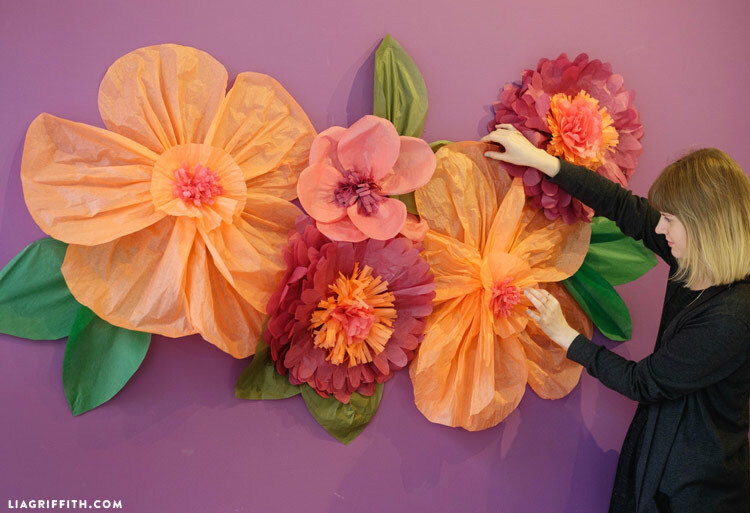 Unfortunately there is no template for the jumbo tissue flowers. Any template would be too large for a 8.5 x 11 sheet of paper! Instead, I added dimensions for the petals and flower bits to the printable instructions. I also encourage you to reference the shapes in the photo tutorial below as you are crafting. Start this project by picking out your tissue paper. We used paper from our line of tissue packs, and you can find those in our tissue shop. We specifically used the pinks from our Tropical Squeeze pack, purples from our Berry Delight pack, and greens from our Holiday Cheer pack. Each of these packs also comes with its own bonus template for more tissue projects! 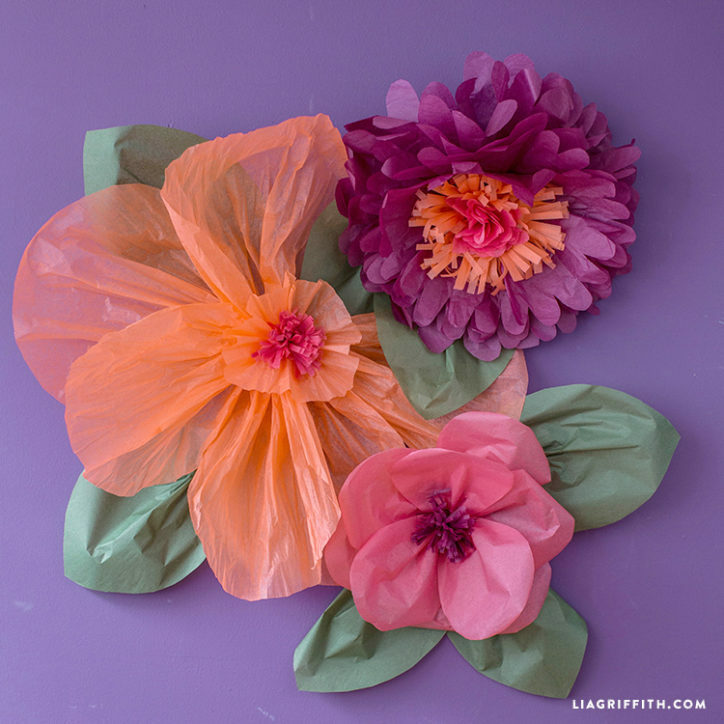 Jumbo tissue paper flowers do not have patterns. Am I jus not seeing them? Hi Linda! We didn’t create a template for these since the flowers are way bigger than any paper we could print a pattern on.